Your hammertoe may not be bothering your too much right now, but hammertoes tend to worsen with time. Jay Bhuta, DPM, at Ankle & Foot Doctors of New Jersey in Millburn, New Jersey, is an expert podiatrist who offers the most advanced treatments for foot deformities and can provide treatment and management of your hammertoe to prevent worsening symptoms. Call the office or schedule an appointment using the online booking tool for expert management of your hammertoe. A hammertoe is a foot deformity in which the first or second joint in one of your toes — usually the second, third, fourth, or fifth — bends to the side, resembling the head of a hammer. In severe cases, the rubbing of your deformed toe may create an open sore on your foot that’s difficult to heal. 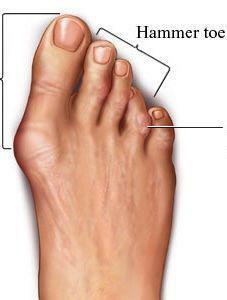 You may have developed a hammertoe due to an imbalance in the muscle and tendon in your toe, causing the abnormal bend. Wearing shoes that are too tight in the toe box may also lead to the development of a hammertoe. Long toes are also at greater risk of developing the abnormal bend. Hammertoes are more commonly seen in women and people with medical conditions such as arthritis or diabetes. What can I expect during an evaluation for my hammertoe? During your hammertoe evaluation at Ankle & Foot Doctors, of New Jersey, Dr. Bhuta conducts a thorough examination of your foot and ankle, reviews your medical history, and discusses your symptoms. To evaluate the extent of your contracture, Dr. Bhuta may recommend an X-ray of your toe. He uses the information gathered from your examination to develop the most effective treatment plan. Dr. Bhuta creates personalized treatment plans based on the severity of your deformity, your medical history, and your symptoms. To begin, he may recommend you change your footwear to allow more room for your toes and prevent progression of the deformity. Dr. Bhuta can also create custom orthotics to help improve your tendon muscle balance. For inflammation and pain, Dr. Bhuta may recommend over-the-counter anti-inflammatories or steroid injections into your toe. To improve strength and mobility of your toes, he may prescribe a home exercise program specifically for your foot and toes. If your toe has become rigid and immobile, Dr. Bhuta may suggest surgery to correct your deformity and improve form and function. For management of your hammertoe, call Ankle & Foot Doctors of New Jersey, or schedule an appointment using the online booking tool.